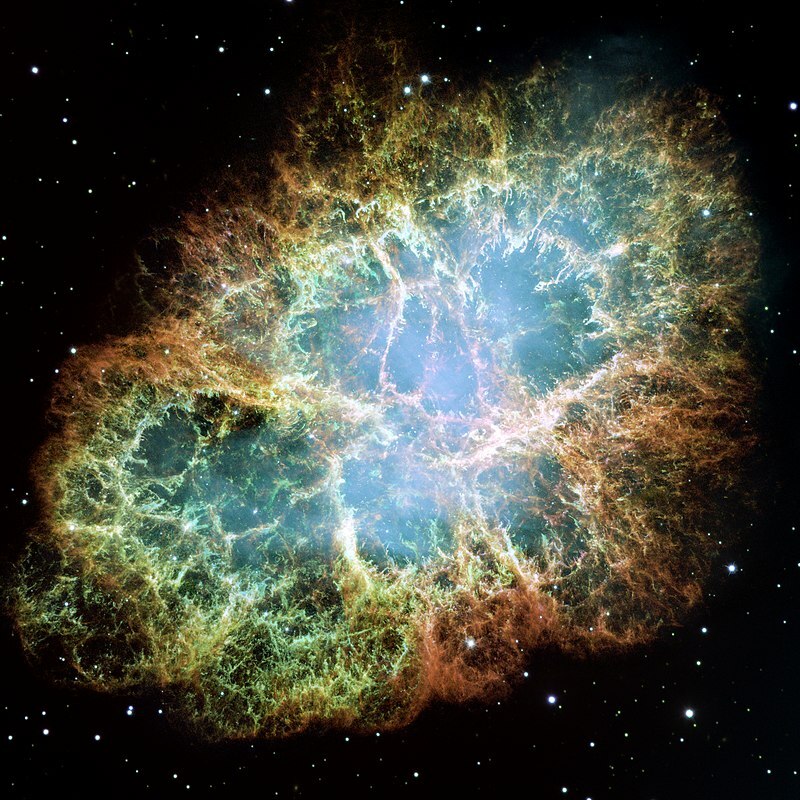 The Crab Nebula, as it’s commonly known, is connected to one of the earliest recorded supernova explosions. In 1054 AD, Chinese Astronomers saw the explosion of this supernova as an incredibly bright star in the sky lasting about two weeks, before fading. Now, nearly 1000 years later, the explosion is still happening as an expanding shock front rich in heavy elements moves through the interstellar medium. When the shock front hits dust or gas it is slowed down, giving the resulting nebula a unique shape. In this case, it looks like a crab. The supernova wasn’t exactly the death of the original massive star. After it exploded it became what is known as a Pulsar, an incredible dense neutron star that is spinning rapidly. To put it in perspective, the pulsar is a star about 10 Km across, but it has 1.5 times the mass of the Sun packed in, and it’s spinning about 30 times a second! This spinning produced a magnetic field that makes the Sun look like a fridge magnet. In 2011, the Major Atmospheric Gamma-ray Imaging Cherenkov (MAGIC) observatory detected photos with TeV energies (Terra electron volts). For reference the energy of a visible photon from the Sun is between 2 and 5 eV, while this Pulsar is firing off photons 1 Trillion times as energetic. These detected energies are higher than anything ever observed from a pulsar before. In fact, they are so powerful that they challenge our current understanding of physics in these extreme scenarios. Whatever is going on, it’s exciting to think about discovering some new Physics to explain what is happening. Though it may just be some regular old Physics contributing in an unexpected way. I guess this is exciting too.